I’m always amazed at the difference between cold and warm season gardens. In the cold season, everything seems to stay nice and tidy, politely growing in it’s designated spot. Growing but not crowding it’s neighbor. Warm season, especially summer, is like BLAHHHHHHH, everything just oozes into each other and if there is no room, it just spills across borders and takes over another area. 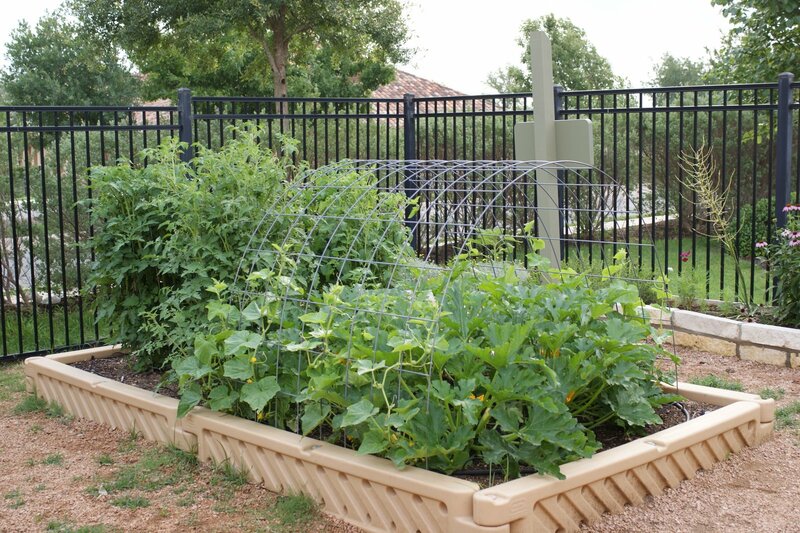 Above is the vegetable bed at the preschool garden. You can see the zucchini spilling out of the bed because it has run out of room. 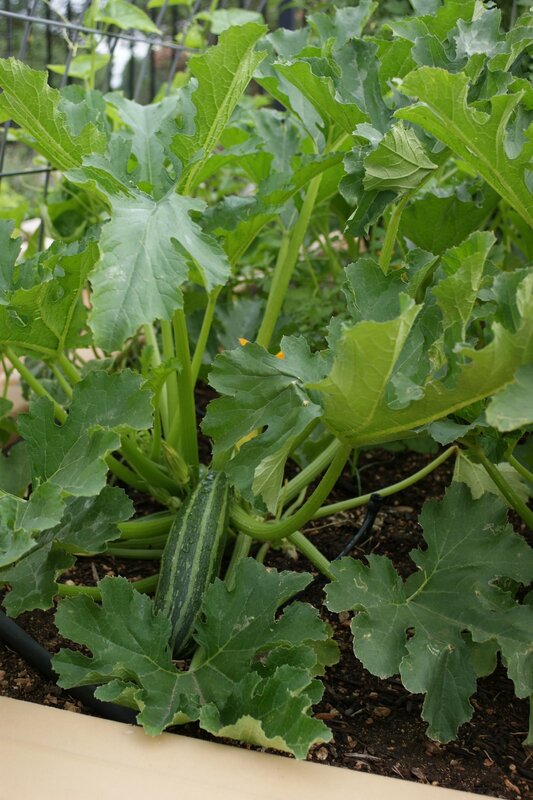 Cucumbers are growing on an arch over the zucchini. We finally had to tie all of the tomato cages in the back together and to the ground to stop them from being puled over by their abundant foliage up top. And those are not wimpy tomato cages either- those are good strong ones that I ordered because I got tired of the wimpy ones. 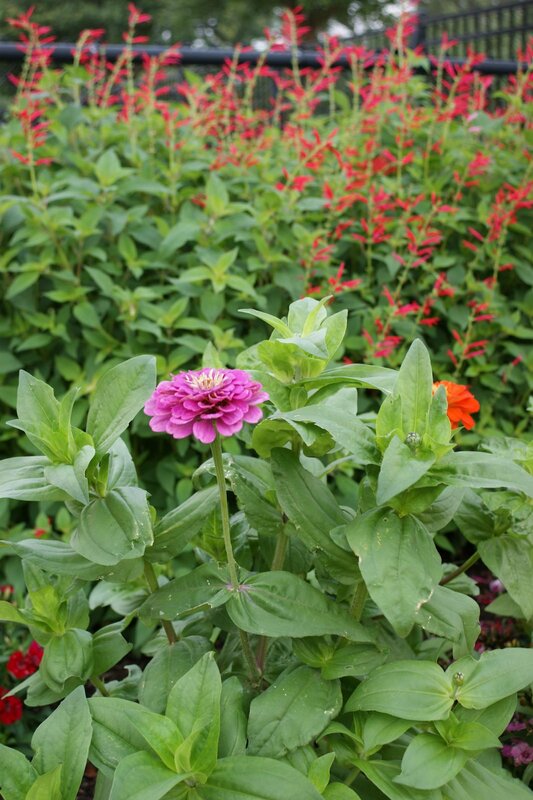 These zinnias took forever to seed, but now that they are going they seem to be shoving each other out of the way. 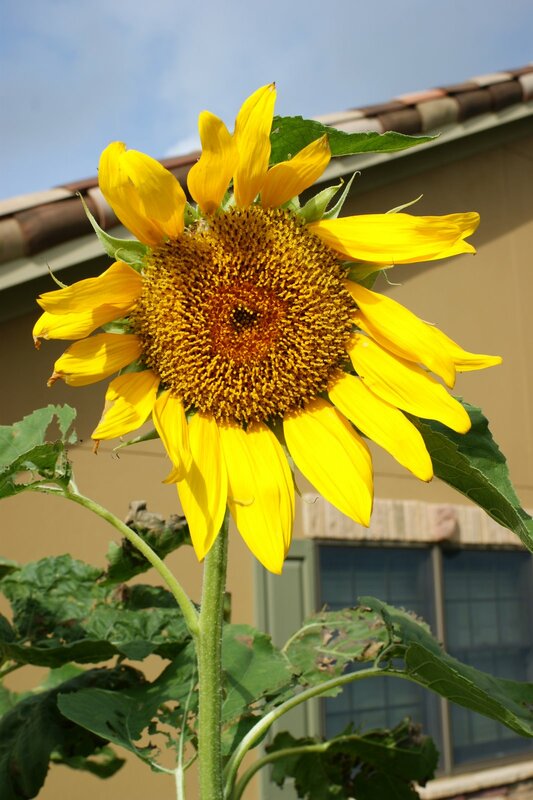 Sunflower- just had to show it because it is so cool. The two year olds planted these and no they are about twice as tall as the planters. Ahhh, here is another shot of the warm weather crazy growth. Pineapple sage on the right whihc has NEVER gotten this big. My god, its a hedge. Herbs in the front with zinnia behind. Can’t even see the Mexican feather grass behind. It’s lovely all this crowding of plants, but it can really be a surprise after the polite garden of last season. And I had to include this last shot. 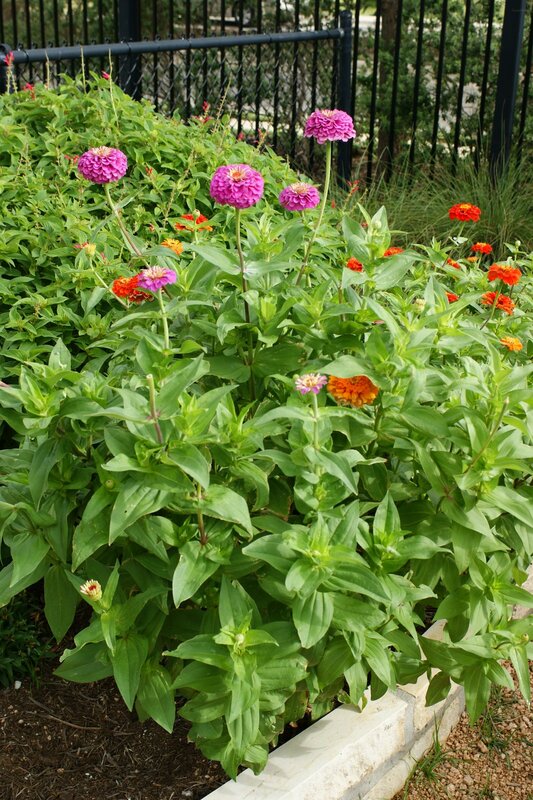 I had a battle getting the zinnias to grow this year in their designated spot in the preschool garden. So I’m cleaning out the garden one day and I carry all the weeds over to the dumpster, and what do I find???? 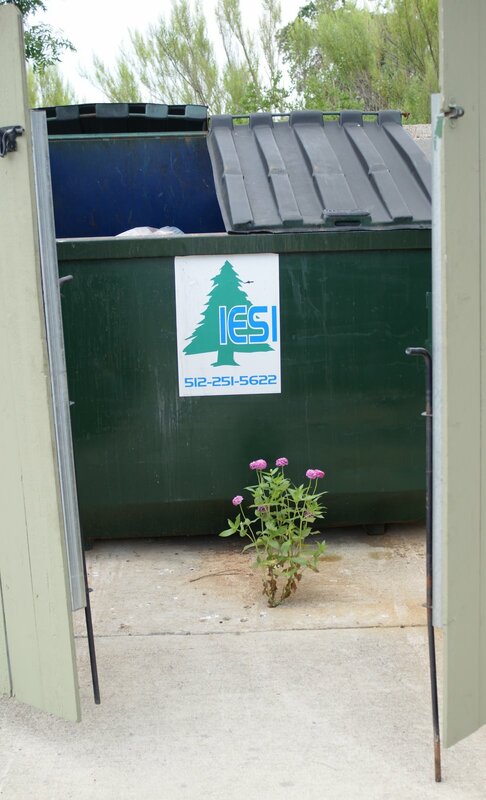 This zinnia growing out of a 1″ hole in the ground where the locking rod for the dumpster door goes into the ground. Just goes to show you there is NO controlling Mother Nature. The veggie garden is rockin and rollin and I just love it. This is a great time of year when the plants are so robust but not overgrown and rude like they will feel about a month from now as I struggle to keep tomato cages from falling over and the hot weather stresses the cucumbers and makes them look sick. Right now everything is just green. The rebuilt garden is working out fantastic with the drip irrigation reinstalled as well. Not only are the transplant and seeds I put in this year doing well, I am also having little seeds from past years coming up that must have gotten to the right spot with the turnover of the dirt during the rebuild. I probably have about 5 VOLUNTEER tomato plants in addition to the 12 or so I planted on purpose. 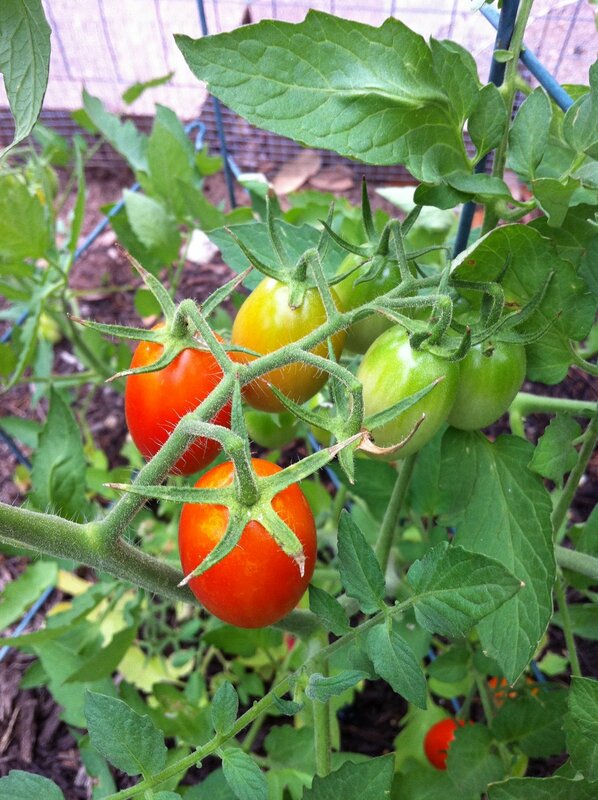 I AM growing other things in addition to tomatoes, but I just happened to get the best photos of the tomatoes this morning. Tomatillos, squash, cucumbers- japanese and pickling size, green peppers, and peas. 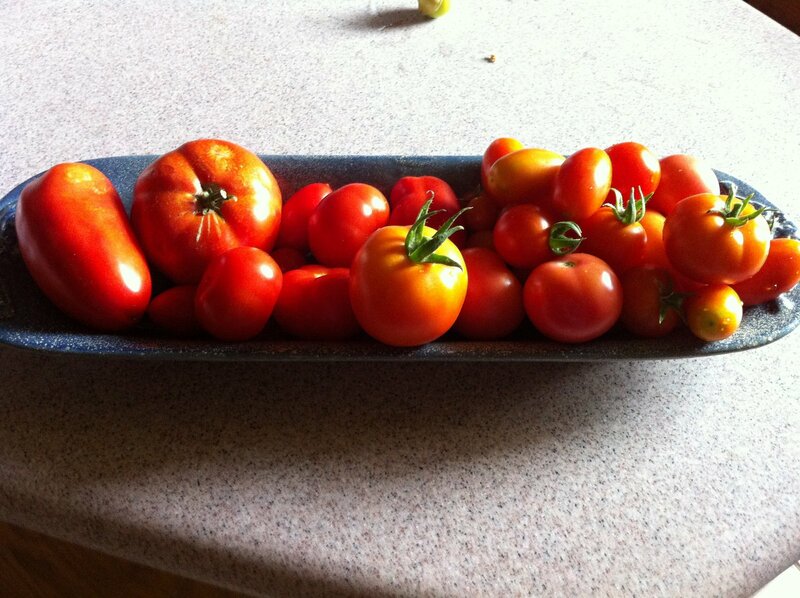 But I have to admit, the tomatoes are the queens of the crop right now. I think I may go on an all tomato diet for my lunches, just sit there and eat them sprinkled with salt. 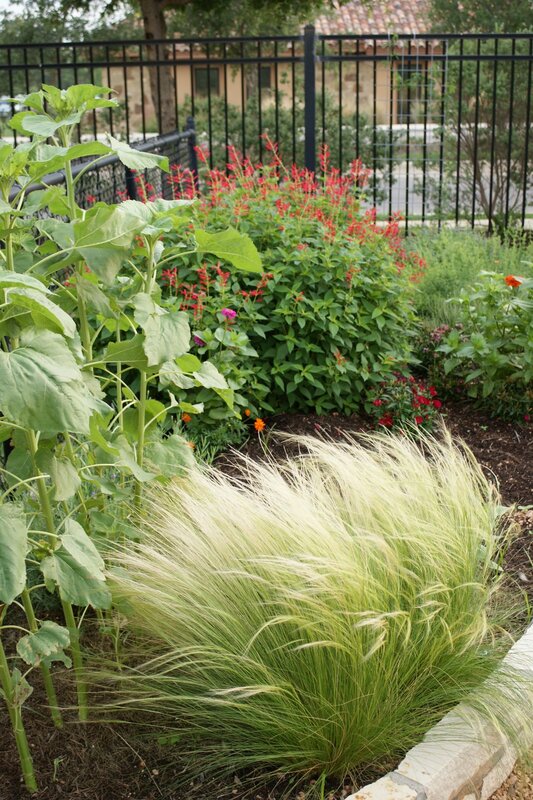 The preschool garden that I manage is REALLY showing off right now with phenomenal growth and great veggie harvests.You can see here the mexican feather grass with pineapple sage in the background and sunflowers growing on the left.Man, don’t you just want to braid that feather grass? Gorgeous. 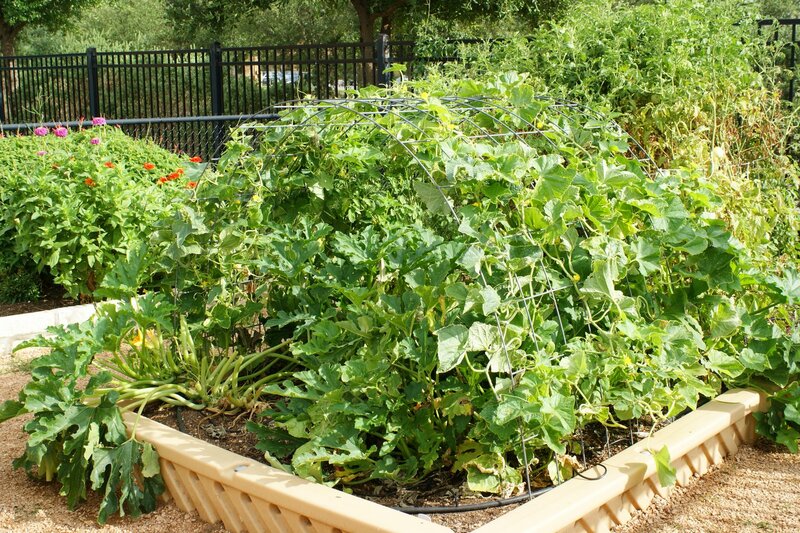 Here’s the center vegetable garden. 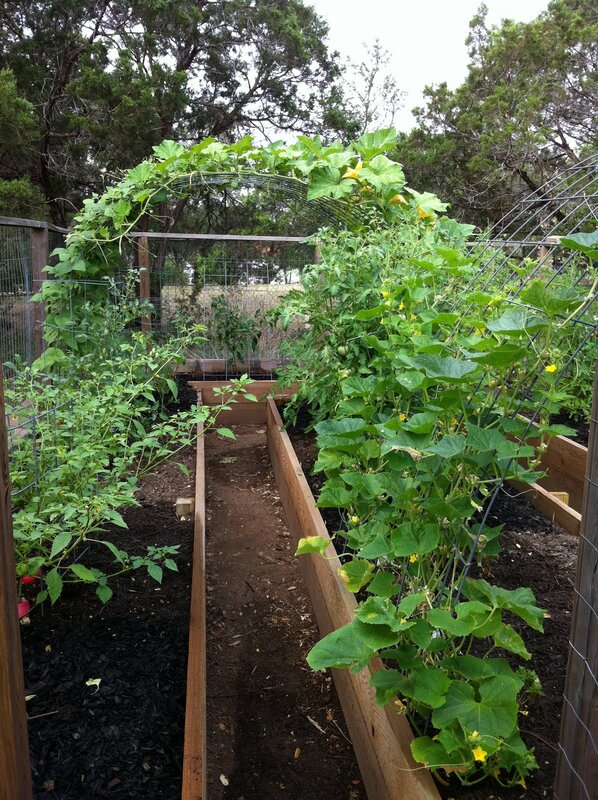 Cucumbers growing up the trellis, zucchini in the middle and tomatoes at the end. We have already started harvesting zucchini and if the kids don’t stay on top of it, we easily end up with 2 foot long zucchinis. I saw the first of the cucumbers hanging down today- the lovely Japanese variety. 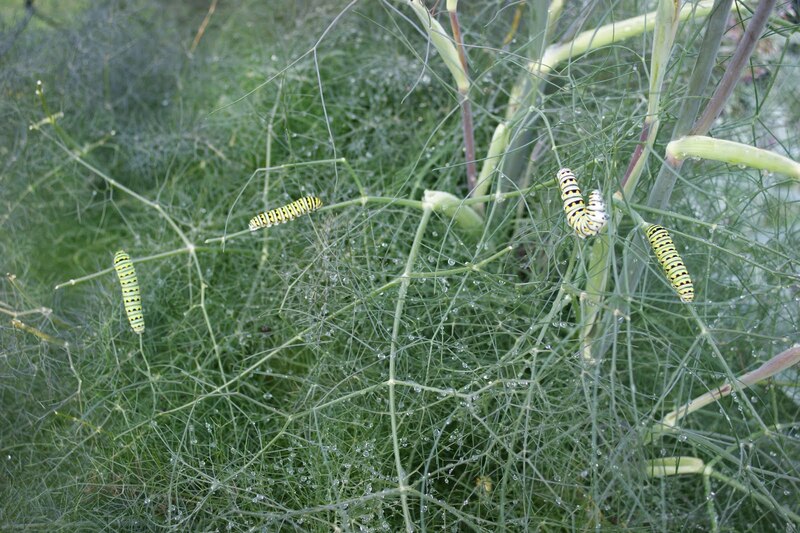 Caterpillars, caterpillars and more caterpillars munching on our bronze fennel. The more the merrier- the kids love to watch them. 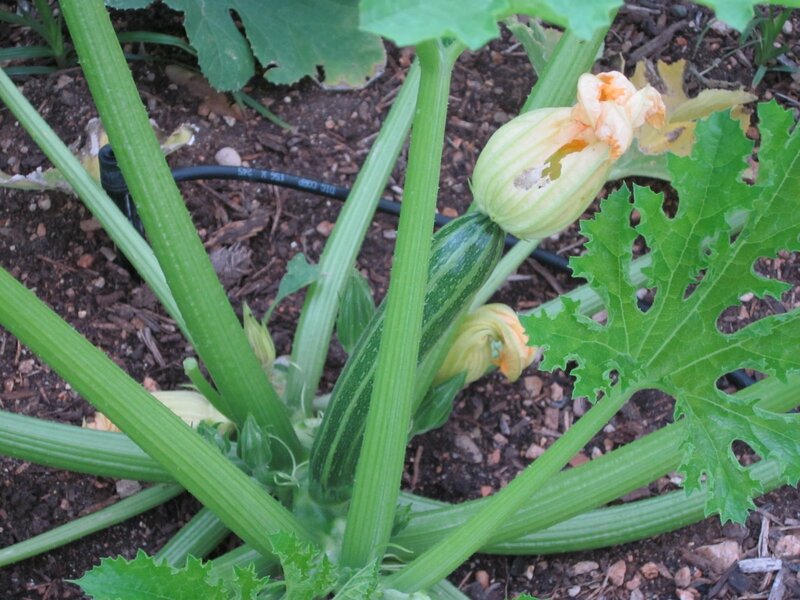 Some of our zucchini really taking off. If the kids wait too long to get there, they can easily grow to club size. I took one home the other day and baked 48 zucchini muffins out of 1 zucchini. 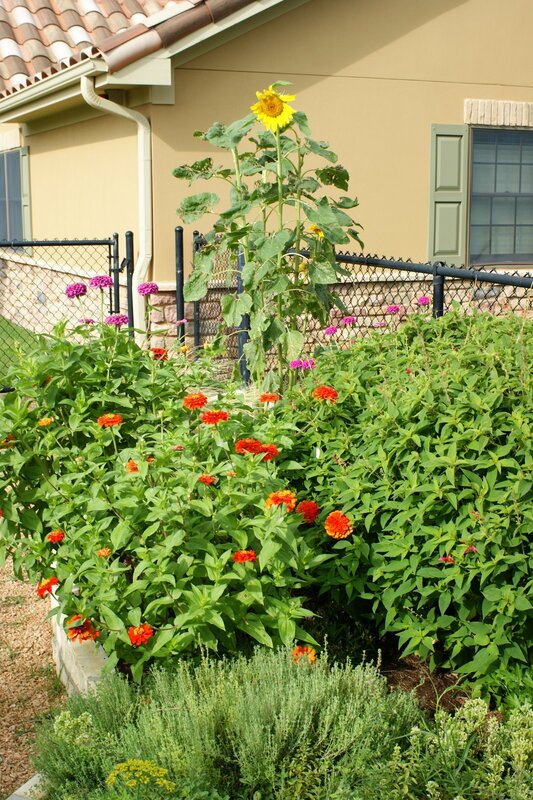 Pineapple sage with zinnias growing in front. The pineapple sage has been phenomenal this year, really took off a ton more than last year. Must have just settled in. 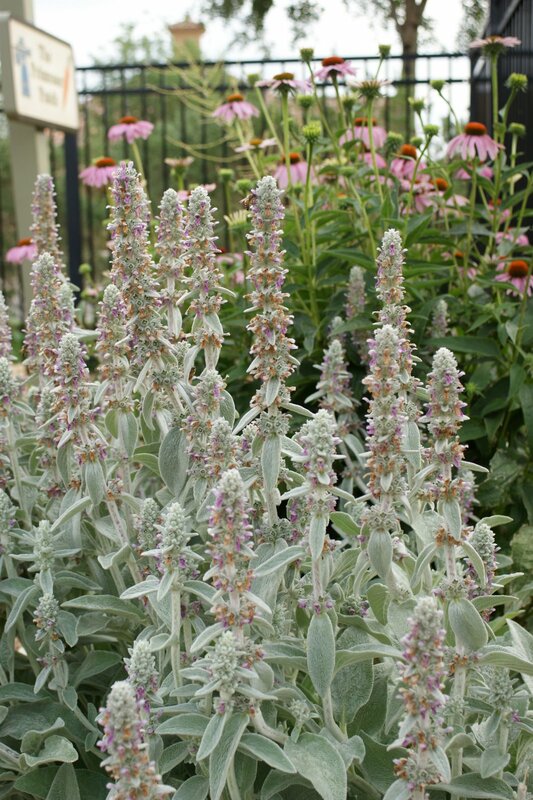 Lambs ear with purple coneflower behind it. 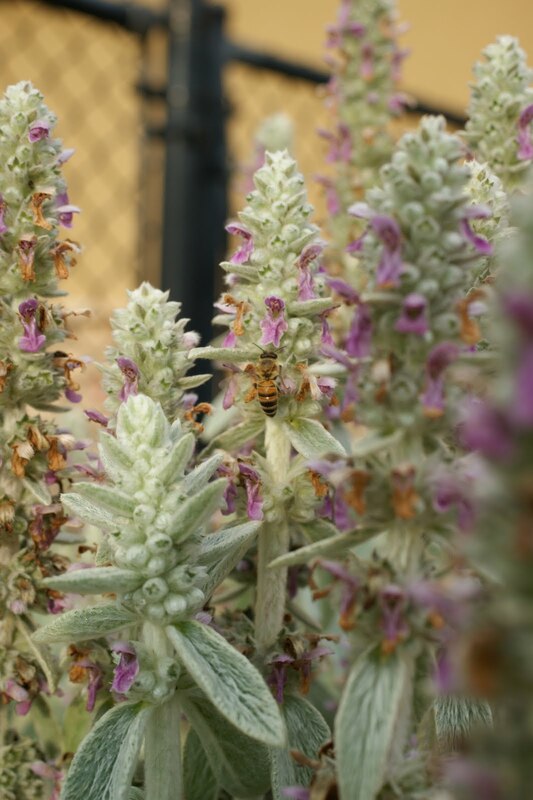 The lambs ear is just swarming with bees right now as it is flowering. Let’s take a closer look. When the kids get a little nervous out there about the buzzing, I just have them chant their mantra: bees are pollinating, bees are pollinating, bees are pollinating. 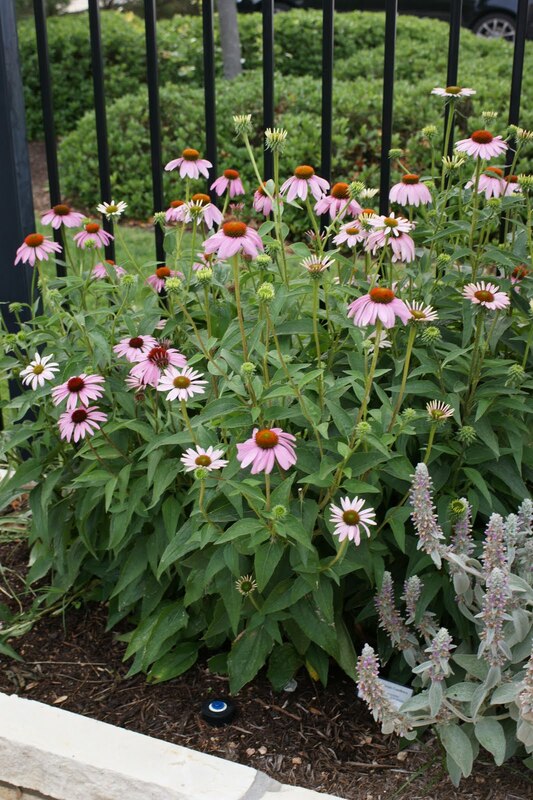 A gorgeous stand of purple coneflowers this year. Some of the preschool girls love to bring these in to their teachers in the morning. Just fine with me as it keeps the plants producing more. 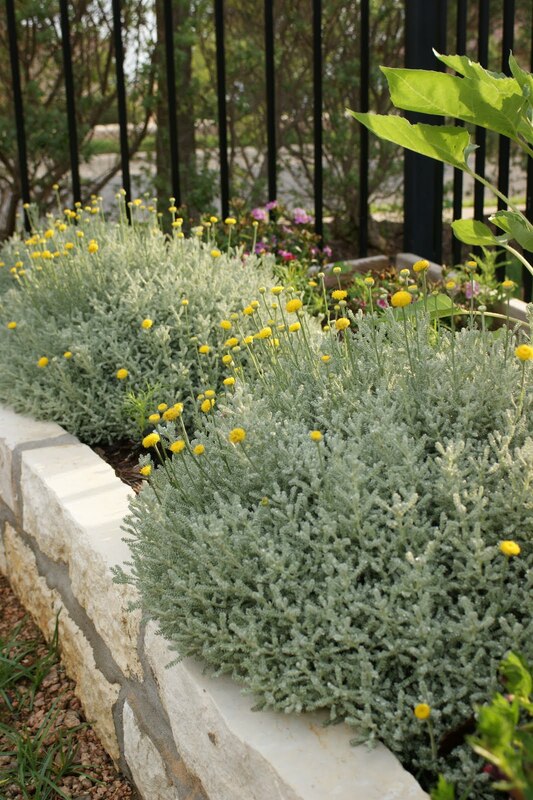 And finally, our santolina with its delicate yellow flowers. 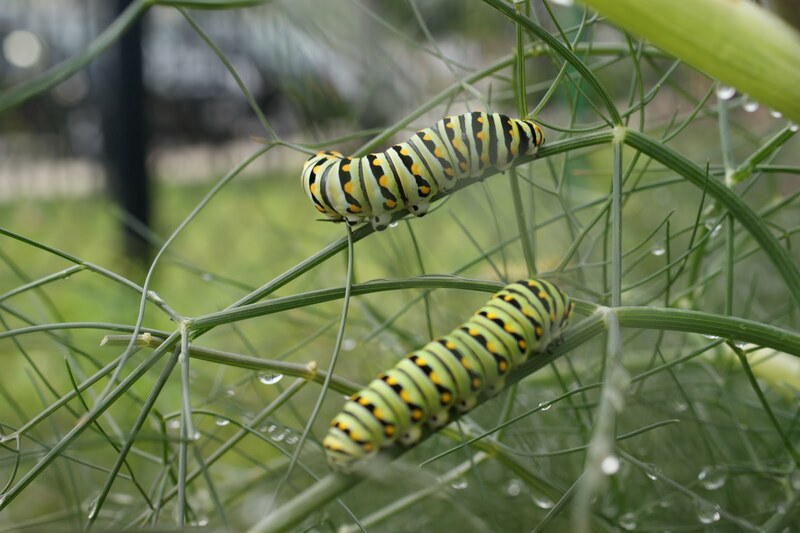 These guys are so great in gardens, just really stand up to weather and slowly, slowly, slowly get bigger. I’m always so excited to see this garden through the seasons as it has been changing and growing. And the kids always shout at me and ask me what I see going on that is new. It’s great to see them really connected with the space and I’m looking forward to working with this program to make it even stronger.